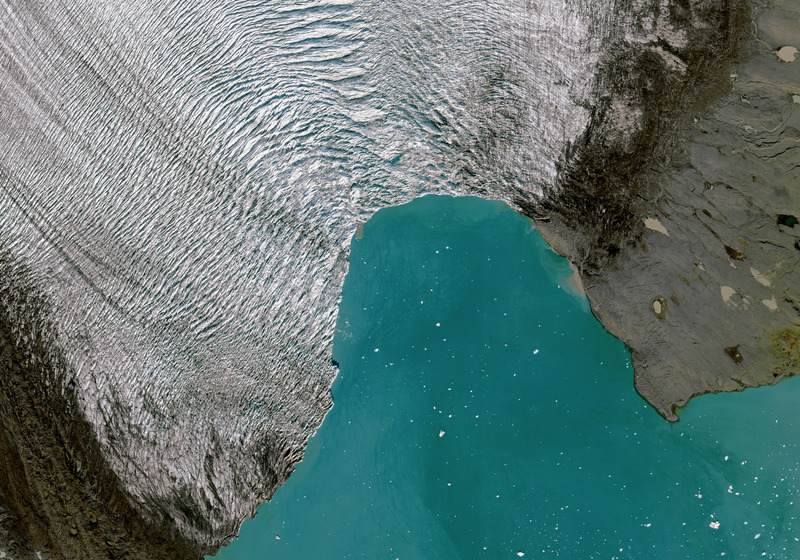 This view, taken by the QuickBird satellite operated by DigitalGlobe, shows the Breidamerkurjökull Glacier in Iceland. The Quickbird is a sub-meter resolution satellite, which means that each pixel of the image represents less than a one square meter area. Breidamerkurjökull is the main glacier of Vatnajökull, the largest ice cap in Europe, which covers 8 percent of southeast Iceland. The white specks in the water are icebergs, big pieces of ice that have broken off the glacier. A few hundred years ago, this area was farmed. But from about 1650 to the late 1800s, Vatnajökull expanded and formed Breidamerkurjökull. This period of slight cooling in the Northern Hemisphere is called the Little Ice Age. Over the past century, Breidamerkurjökull, along with 90 percent of the world’s glaciers, has been receding due to climate change. Glaciers recede when the snow and ice melt in the summer is greater than the accumulation in the winter. Shrinking glaciers contribute to rising sea level, which puts low-elevation coastal areas in jeopardy. What’s more, declining spring run-off causes increased water shortages in areas that depend on glacial water, such as the U.S. Pacific Northwest and quite a few major South American cities, including Quito, Lima, Santiago and La Paz.